Ask fellow campers about "Estes RV Resort" and nearby attractions. A small RV park. There was a 3-night minimum when I booked a reservation. I was put in a spot normally occupied by someone else who was traveling. It rained one day I was there and a small lake formed outside my trailer entrance. No cap on sewer pipe. I used four sets of leveling blocks to create a path to my door. Good wifi. There are tons of RV places in this area. My experience was not great so I would select a different park next time. We camped at Estes RV Resort in a Travel Trailer. Clean park with nice level concrete pads for parking the RV. Able to walk dogs on the St. Augustine grass w/o getting grass burs. Small washateria on site for guests to use. Nice young owner seems dedicated to making improvements to his park. We camped at Estes RV Resort in a Motorhome. Located off of state hwy 35 - close to both Rockport and Aransas Pass for any shopping needs. I have been to many resorts and parks but this one is the nicest one by far with it's beautiful campgrounds and the fact that we could park in a slot that had trees to shade us while we sat outside drinking our morning coffee. The manager was very friendly and stopped by to see how we were doing and to ask if there was anything he could do to make our stay better, I told him he just did by stopping by. I will revisit this park again. We camped at Estes RV Resort in a Motorhome. Can we keep this our little secret? This is a small park, and I am afraid too many people will find out and there won't be room for us next time! We visited other RV parks in the area and, in our opinion, this is was the classiest and cleanest RV park in the area. The actually had real landscaping and St. Augustine grass between each of the RV sites. Each spot has underground sprinkler system to keep the grass beautiful. Cement pads and very tidy, well maintained. 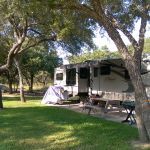 This was our first visit to the Rockport area and didn't realize a 43 ft motor home was rare; almost everyone else in the area was in a trailer or 5th wheel. We were very grateful/lucky Estes RV park had a space big enough for us and although they have great trees, none gave us concern. We were in spot 3. The park host was delightful and he loved our dog, Jack. I also have to say we were pleased there were no children in the park on our particular visit. We are grandparents but then there are times we just want quiet. We camped at Estes RV Resort in a Motorhome. Estes RV Park is a really nice, small, clean and well maintained park. The host are super nice folks that do everything possible to make you feel at home. Verizon cell service leaves a little to be desired, but that's not the parks fault. We really enjoyed our stay here and hope to make it back there. We camped at Estes RV Resort in a Fifth Wheel. Rate is using monthly rates. This is a very nice park; small and intimate. This was a wonderful spot to spend the winter. We were here for 3.5 months. The park is midway between Rockport and Aransas Pass on Business 35. The hosts are wonderful! They go out of their way to make you feel welcome and included. The photos on the website are accurate. The sites are fairly close together but there are Live Oaks between them along with nicely landscaped areas. The pads are all concrete; although, the road coming in from the highway is dirt and has many ruts. It would make the park even nicer if that were paved. Cable TV and Wi-Fi are included. There is a clubhouse and laundry facilities. The grounds and facilities were all clean and well-maintained. Our only complaint is with Verizon, as phone and air card signal is poor in this area. Even so, we will return next winter. We camped at Estes RV Resort in a Motorhome. Very nice hosts, and as nice as the pictures indicate. The road in is gravel and a bit tight, and the sign on the highway is hard to see, but otherwise, a nice place to stay and we certainly would come back. We camped at Estes RV Resort in a Travel Trailer. We have stayed here numerous times in the last few years. There is even a small "cabin" to rent. It is cute and we stayed here one time when we did not bring our fifth wheel. This park is immaculately landscaped and well maintained. It is quiet and peaceful but very close to everything you need. The owners are great and we will definitely be returning again soon. We camped at Estes RV Resort in a Fifth Wheel. Are you affiliated with Estes RV Resort ?